THE QUALITY of patents granted at the EPO is declining sharply (EPO insiders say so), whereas many patents granted by the USPTO are nowadays being invalidated (while many applications are also being denied). Will the patent microcosm ever learn? It’s overusing and misusing the patent system, apparently 'buying' examiners in pursuit of these nefarious goals. People are starting to notice. The reputation of patents is, as a result of that, suffering. The same thing happened to copyright law after far too many term extensions (well beyond one’s lifetime), resulting in widespread attitude that’s copyright-hostile. The term “copyright maximalists” inspired us to come up with — if not coin — “patent maximalists”. Heredity is so hot right now. In 2017, the number of people who who’ve had their DNA analyzed for the purposes of tracing their genealogy doubled to more than 15 million. The largest of these direct-to-consumer companies, Utah-based Ancestry, tested two million people in the last four months of 2017 alone. But that’s still just a tiny fraction of the world’s population. Which means there are a lot more people out there who could be tested, and the company that woos them can use their valuable data to do other kinds of research and product development. There’s a lot more than just spit at stake. The patent in dispute describes a method of analyzing regions of the genome shared by family members—dubbed “identical by descent,” or IBDs. The further back in time you go, the shorter and more spread out the long idententical stretches become. And that happens in a mathematically predictable way; IBD levels decay exponentially with each generation. Which means you can pretty easily determine how related two people are just by calculating the sum of the lengths of every IBD they share and the percentage of shared DNA in each one. This company is one that increasingly looks into the business model of patent trolls. It uses bogus patents that oughtn’t have been granted. Will it get its way? We doubt it. Expect a settlement at best, but never a win. I construct a measure of patent novelty based on linguistic analysis of claim text. Specifically, I employ advanced computational linguistic techniques to analyze the claims of all U.S. patents issued from 1976-2014, nearly 5 million patents in total. I use the resulting model to measure the similarity of each patented invention to all others in its technology-temporal cohort. Then, I validate the resulting measure using multiple established proxies for novelty, as well as actual USPTO Office Action rejections on grounds of lack of novelty or obviousness. I also analyze a set of pioneering patents and find that they have substantially and significantly higher novelty measures than other patents. This sounds like borderline pseudoscience — the kind of nonsense that convinced Battistelli that examiners can magically be replaced with computers. Some people out there, especially patent maximalists, even fancy using computer algorithms to automatically/autonomously generate new patent applications. They don’t get it, do they? Do we want machines to write patents and then examine these patents too? What would be the point of such systems? Might as well smash this whole bubble. Always remember that public interest is a factor in patent policy and if the public no longer feels like patents serve their purpose (e.g. “innovation”), it will turn against them and demand change. 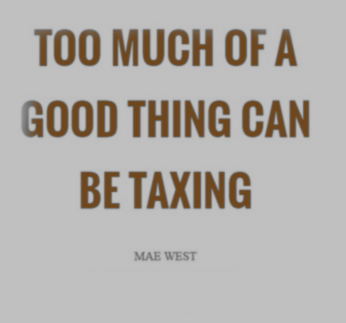 The patent maximalists walk on a thin rope here and they will certainly fall if they keep pushing the envelope of maximalist agenda. EPO protests are sometimes organised by the public, not just workers. The software categorizes components as those “with or without 3rd party pricing supervision” — prices monitored by specialist publications or insurers — according to three client presentations seen by Reuters. For example, in France, Securite Reparation Automobile (SRA), a group backed by insurers, measures car parts inflation and publishes this in the hope it will help exert downward pressure on parts inflation. If it weren’t for patents, other companies would be able to manufacture compatible parts and compete based on price. As long as designs are patented, however, there are barriers to competition and customers suffer the most. In fact, many cars will never be repaired at all because the parts are too expensive. This, in turn, harms the environment (less recycling, more manufacturing). When you think of 3D printing, images of space-age shapes and maybe even a man named Chuck Hull get conjured up. Hull: the man widely dubbed as ‘the father of 3D printing.’ It’s true Hull – now 75 and still working as chief technology officer of 3D Systems – did patent a 3D invention in 1986, but two years earlier in the heat and humidity of Greenville, SC, the idea had already been born by Bill Masters. Masters, who still resides in South Carolina, is widely known as the father of modern kayaking, founding and running Perception Kayaks from 1975 to 1998. It was on the banks of a kayaking trip that Masters began thinking about spitballs, of all things, that eventually led to 3D printing. His full list of patents related to 3D printing are: 4,665,492, 5,134,569, 5,216,616, 5,546,313 and 5,694,324. These patents are going to price EVs out of reach. In this article, I compute a “three-year grant rate” that shows the probability of obtaining a granted patent within three years of the first office action. THE patent microcosm can fool and manipulate the Iancu-led USPTO all it wants. At the end it’s down for judges (in courts) to decide validity of patents in actual trials. On May 21, 2018, the Federal Circuit, in an opinion authored by Judge Wallach, ruled that patent owner D Three could not claim priority from U.S. Patent Application No. 61/150,301 (“the 2009 Application”), affirming the U.S. Federal District Court for the District of Colorado. D Three Enterprises, LLC v. SunModo Corp., Nos. 2017-1909, 2017-1910, 2018 (Fed. Cir. May 21, 2018)(Before Reyna, Clevenger, and Wallach, J.). D Three Enterprises had sued SunModo Corp. and Rillito River Solar (doing business as EcoFasten) in the District of Colorado for infringement of various claims of alleging infringement of various claims of U.S. Patent Nos. 8,689,517 (“the ‘517 patent”), 9,068,339 (“the ‘339 patent”), and 8,707,655 (“the ‘655 patent”), which are directed to roof mount sealing assemblies. The allegedly infringing products were available to the public in June 2009 and 2010. To sustain its claim for patent infringement, D Three claimed priority to the 2009 Application, the parent application for the patents-in-suit. The parties agreed that the patents would be invalid without the benefit of the 2009 Application. Notice that this has nothing to do with Section 101. Judge Pauline Newman has been concerned regarding constitutional issues raised by the U.S. Patent and Trademark Office Patent Trial and Appeal Board’s implementation of inter partes review as provided by the Leahy-Smith America Invents Act (codified at 35 U.S.C. § 311 et seq.). Specifically, Judge Newman’s concerns involve separation of powers issues and accordingly, are different from the issues raised in Oil States Energy Services, LLC. v. Greene’s Energy Group, LLC. As for the invalidity arguments, the panel held that the District Court did not abuse its discretion in denying Trans Ova’s post-trial motions and that the jury’s verdict was supported by substantial evidence (from XY’s expert). Why is Linux Not More Widely Used Than It Is? Before KDE, GNOME, and other desktop environments came around Linux (specifically Interim Linux) was entirely CLI driven. By this time Macintosh and Windows had fully functional GUI software and those were more appealing to the average user. On this note, Linux got off on the wrong foot and this has come a long way to tarnish its image. Applications like the ones in Microsoft’s Office Suite and Adobe’s collection are still not available on the Linux platform without some type of hack and since most of mankind cannot be bothered but to try, they go for what they can easily work with. Since the unveiling of Spectre Variant Four last month ARM has been publishing patches for their mitigation for the 64-bit ARM CPUs. While the Intel/AMD and POWER mitigation landed for Linux 4.17, the SSBD work on AArch64 is landing for Linux 4.18.
here we are, with 4.17 released. - I’ll switch over. That was what happened for 4.0, after all. mostly drivers, networking, perf tooling, and a set of nds32 fixes. much too big to list in that format. more important, but it’s always nice to see spring cleaning like that. While there was a lot of last minute changes this week, Linus Torvalds has just gone ahead and officially released the Linux 4.17 kernel. Linux 4.17.0 is now available as the latest stable kernel while this marks the opening of the Linux 4.18 merge window for a two week period. Linux 4.17 has some pretty great features especially on the AMDGPU front. See our Linux 4.17 feature overview for a complete overview of the major changes to find in this new kernel version. It’s certainly yet another very exciting release! The release announcement by Linus Torvalds is mostly the usual commentary. He does note that around Linux 4.20 is when he intends to declare the “Linux 5.0″ kernel, similar to Linux 3.20 becoming Linux 4.0. If all goes well, the Linux 4.17 kernel will debut as stable today. Linus Torvalds last week indicated that this next kernel stable release could be coming for this weekend, but there has been a lot of changes merged in recent days, so we’ll see if Linus is still leaning towards releasing today or instead opts for Linux 4.17-rc8. Whatever he ends up deciding, there are a lot of great changes with Linux 4.17. The Linux Foundation yesterday announced the Acumos AI Challenge, sponsored by AT&T and Tech Mahindra. The challenge “is an open source developer competition seeking innovative, ground-breaking artificial intelligence (AI) solutions from students, developers, and data scientists”. The challenge is accepting submissions May 31 to August 5, 2018. The 1st place team will win $50,000, and the 2nd and 3rd place teams each will receive $25,000. Derek Foreman at Samsung’s Open-Source Group has initiated a formal discussion over the Wayland and Weston release schedules. Due to the most recent Wayland/Weston release happening in April rather than their usual February release, if sticking to a six-month release cadence that means the next Wayland/Weston release will be in October. When using a GCN 1.1 CIK / Sea Islands GPU with the non-default AMDGPU DRM driver, it will soon begin defaulting to use PowerPlay for power management rather than the old DPM code. The AMDGPU PowerPlay support for Sea Islands is now in a state where using the newer PowerPlay support rather than the older Dynamic Power Management (DPM) code is in better shape. AMD plans to eventually drop this older DPM implementation from the AMDGPU kernel driver. Intel’s Clear Linux distribution is quite performant as shown by our many Linux distribution benchmarks for delivering lightning-fast out-of-the-box Linux performance that is generally unmatched by other distributions. While the Clear Linux package (bundle) archive continues getting larger and more desktop packages are being included, one area that sadly had been left out up until recently was support for RadeonSI/RADV. Up until recently their Mesa build was just with the Intel OpenGL/Vulkan driver support as well as the software rasterizers, but now the open-source Radeon drivers are being included as well as Nouveau too for open-source NVIDIA driver support. I took Clear Linux’s Radeon stack for a whirl to check out the performance capabilities. The AMD developers maintaining the PAL (Platform Abstraction Layer) and XGL components comprising the official AMDVLK Linux Vulkan driver have made public their latest code commits from the past week. It’s been a while since last having any Linux driver progress to report on for the DisplayLink hardware that is found in many of the USB-powered displays. Fortunately, Red Hat developer Mikulas Patocka has posted a set of improvements to the DisplayLink kernel drivers of the UDL-KMS DRM driver and the UDLFB frame-buffer driver. Mesa 18.0.5 is now available. finalizing that were causing assertions in CTS tests. Finally, we have also several other fixes in different parts of the framework. Mesa 18.0.5 is out as the latest point release for the Mesa 18.0 release from Q1’2018, but it also now marks the end of the series. The Mesa 18.0.5 update has several Intel i965 OpenGL driver fixes, some core Mesa fixes, a few updates for the RADV Vulkan driver, and other basic alterations. This though is the final planned point release now that Mesa 18.1.1 is out so users are encouraged to upgrade to this newer series, or if you enjoy the bleeding-edge graphics stack, you can always be riding Mesa 18.2-dev. Yesterday I posted some Radeon graphics benchmarks under Clear Linux now that Intel’s performance-optimized Linux distribution ships with AMDGPU+RadeonSI/RADV support. While doing that comparison I also took the opportunity to run some fresh UHD Graphics “Coffeelake” benchmarks on Clear Linux against Ubuntu. It’s been a long time since the last release of Ardour, and there’s still no schedule or even vague sense of when the next release might appear. I (Paul) felt that our users, and particularly our subscribers, deserved some information about what is and has been going on with development over the last 8 months. I had promised to do this back in December, and it is now long overdue. For those wondering what’s been going on with the Ardour digital audio workstation cross-platform, open-source software, their developers have posted a status update about their ongoing progress to the project. Ardour, for those that don’t know, is one of the leading (if not the leading) open-source digital audio workstation software for audio recording, editing, and mixing. It’s a mighty impressive piece of software currently, but the developers are working on making it even better. Nearly one year after the release of Opus 1.2, the Opus 1.3 release is happening quite soon with Friday marking the availability of the release candidate for this open-source and versatile audio codec implementation. 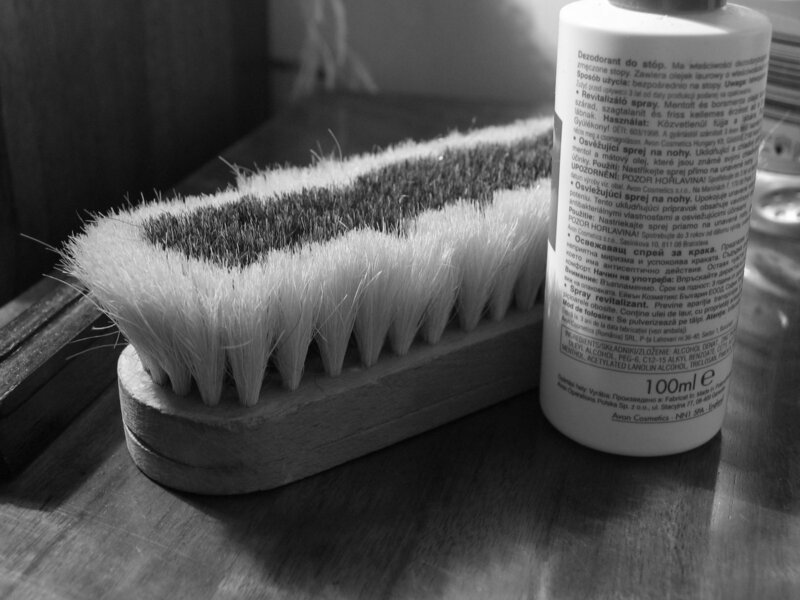 A data scientist devotes considerable time and effort collecting, cleaning, and filtering data. The goal is to extract valuable insights and useful information from that data. Anything that speeds up that process is going to be desirable. Being able to interactively explore data helps streamline this process. An increasingly popular way to interact with data is with an interactive notebook. So what’s this type of notebook offer? A notebook interface is a virtual collaborative environment which contains computer code and rich text elements. Notebook documents are human-readable documents with the analysis description and the results together with the executable documents which can be run to perform data analysis. These documents can be saved as files, checked into revision control just like code, and freely shared. They run on any platform, thanks to their browser-based user interface. In essence, they are a virtual notebook environment used for literate programming. They offer a great developer experience and allow for rapid development and extensibility. Avidemux, a popular free video editor, is now available on Flathub, making the latest version easy to install on most Linux distributions. Flathub is a Linux app repository powered by Flatpak, which allows apps to run on almost any Linux distribution. Doom’s success lay not only with its addicting gameplay and technical innovations, such as its introduction of a portable game engine, but also in its innovative digital distribution. Note the prominent “shareware” advertisement on the top front of the game packaging. This groundbreaking game earned a spot in the inaugural class of the World Video Game Hall of Fame. Ever fancy using your vast wealth to hire lobbyists and manipulate the media to get politicians to do what you wanted while you crush your economic rivals? Plutocracy is a game that will allow you to live your wildest oligarchic fantasies but its developers are seeking to raise more funds to finish the game first. Though there’s still a long way to go before the game is polished and complete, I found that the initial build has a few promising things that you can enjoy already. This metroidvania title has you facing off the scourge of biological life to save your robotic utopia. After spending my time blasting everything with a pulse I have a few thoughts to share. One of the most fascinating hobbyist projects of interest on Phoronix in recent years has been Arcan, the display server built off a game engine and that has been amassing an interesting feature set, and with it the project’s Durden desktop environment. The project is celebrating its two year milestone since going public so they have recapped some of their recent work. Two years has passed since the public presentation where Arcan and its ecosystem of side projects and tools started to creep out of the woodworks; although the project had been alive and worked on for well-over a decade at that point. A lot of things have evolved and developed in a positive direction since the time of that presentation, and this post aims to provide an overview of those changes. “Free” and “Linux” go hand in hand beautifully, like chips and a milkshake, and even though Linux isn’t widely seen as a gaming platform, there is a veritable wealth of free games you can get for it if you look in the right places. That’s in large part thanks to unpaid, open-source developers, who collaborate to bring classics (and new games) all together in Linux. Another week, another dose of Usability and Productivity in KDE land! We picked up a lot of great improvements to Discover, a much-requested change to allow Kate and Dolphin to be run with the root user account again, and quite a lot of important bugfixes. Most of my writing on this blog is about FreeBSD, KDE, or Calamares. So it gives a bit of a one-sided view of what I do. There’s lots of pictures of rhubarb crumble, for instance, that never see the bloggy light-of-day. But I can build more than just software! Two months ago an unusually heavy storm blew down part of the fence in my back yard, which wasn’t really good for the privacy of that yard. At the 2018 Krita Sprint we had a special guest: Valeriy Malov, the maintainer of the Plasma Wacom tablet settings module. We’ve asked him to write about his experience at the sprint, so over to him! This is my Krita 2018 sprint report and general report / pre-release announcement for new version of wacomtablet. The timezone-selection widget in Calamares was borrowed from some distro installer a long time ago, and at some point the images were resized, and some math corrected to map image points to latitude and longitude on the map. The resizing introduced some aliasing artifacts, and then the math moved locations far north — where a typical map projection is “stretched out” to the wrong spot. Some time ago I fixed up things above 65 degrees north or so. Reykjavik is at 64-and-a-bit north, so wasn’t handled then. And it was a bodge anyway. Last year, I worked on the project ‘Pitivi: Color correction interface using three chromatic wheels’ as part of my Google Summer of Code. This year again, I’m working on Pitivi under the GNOME organisation. Mathieu Duponchellle and Thibault Saunier are mentoring my project this time. Gestures like these is now how almost all input is handled in Nautilus. The exception is the stuff that has no event controller counterpart in GTK+ 3. This summer I’m working on porting Nautilus to GTK+ 4 as part of Google Summer of Code, and I’ve spent the entirety of the time on getting rid of deprecated 3.x API and obsolete ways of handling events. Despite slightly hack-ish ways of working around deprecations, it’s been smooth sailing so far – No Regressions™! Almost ready to switch†! The status of the 4MLinux 25.0 series has been changed to STABLE. Edit your documents with LibreOffice 6.0.4.2 and GNOME Office (AbiWord 3.0.2, GIMP 2.10.0, Gnumeric 1.12.40), share your files using DropBox 47.4.74, surf the Internet with Firefox 60.0 and Chromium 66.0.3359.26, stay in touch with your friends via Thunderbird 52.7.0 and Skype for Web, enjoy your music collection with Audacious 3.9, watch your favorite videos with VLC 3.0.2 and mpv 0.27.0, play games powered by Mesa 17.2.5 and Wine 3.8. You can also setup the 4MLinux LAMP Server (Linux 4.14.39, Apache 2.4.33, MariaDB 10.2.14, PHP 5.6.36 and PHP 7.2.5). Perl 5.26.1, Python 2.7.14, and Python 3.6.4 are also available. Repology is monitoring package repositories across Linux distributions. By now, Atom feeds of per-maintainer outdated packages that I was waiting for have been implemented. So I subscribed to my own Gentoo feed using net-mail/rss2email and now Repology notifies me via e-mail of new upstream releases that other Linux distros have packaged that I still need to bump in Gentoo. In my case, it brought an update of dev-vcs/svn2git to my attention that I would have missed (or heard about later), otherwise. Finally! A new pacman release, this version adds some critical bits for reproducible builds and the pacman repository has been shed of misc tools which are now in pacman-contrib. Time after time the open-source software company steps up to make sure those of us who choose Linux aren’t left behind when new technologies, standards and devices emerge. Case in point today: the Dell Canvas. GNOME’s Christian F.K. Schaller has revealed that Dell and Red Hat developers are working together to add Linux support for the Dell Canvas to the Linux kernel. I was very happy then (as I am now) that the code is out there even though none of us whose code was published in the newsletters had any notion of copyright. Code was there to be freely copied and worked on. Yes, a radical idea which in 1984 got codified by Richard Stallman’s Free Software Foundation (www.fsf.org). The time has come for NYC Debian folks to gather. I’ve bravely volunteered to host a local bug squashing party (or BSP) in late June. The wonders of a week of vacation that was spent mostly working on free software! The headline releases were remctl 3.15, which fixes a long-standing correctness bug on the server and adds more protocol validation and far better valgrind support, and podlators 4.11, which fixes a buncho f long-standing bugs in Pod::Text and its subclasses. We round-up the latest news about Ubuntu 18.10, including the release date, planned features, upgrade process, and more. You can consider this article your definitive guide to everything you need to know about the upcoming release of Ubuntu 18.10 ‘Cosmic Cuttlefish’. And as this post is kept up to date with the latest developments, features, and plans you can bookmark it now and check back again at a later date. At an event held in China, Xiaomi unveiled the next version of its Android ROM — MIUI 10 — along with the launch of new smartphones variants: Mi 8, Mi 8 Explorer Edition, and the Mi 8 SE. The latest version of MIUI comes with some major design changes and new features. This update will bring performance improvements, several AI-based features and take advantage of the full-screen bezel-less displays. So let’s take a look at all new features in MIUI 10. What is Pro Mode in the Samsung Galaxy Camera, and What Can You Do With It? Samsung Galaxy smartphones typically have great cameras. Pro Mode lets you move beyond the simple “point and shoot” features by unlocking advanced adjustments like ISO and aperture settings, and letting you tweak just about every aspect of the photography experience. Here’s how to access and use it. The driver behind the release 18.05 is the rapid evolution of the Sculpt general-purpose OS. Following the initial version from February, which was targeted at early adopters, the new Sculpt for The Curious (TC) introduces a much more welcoming and empowering user experience (Section Sculpt for The Curious). Version 18.05 of the Genode operating system framework is now available along with the second revision to its Sculpt OS, what desires to become a general purpose OS based upon Genode. The Sculpt operating system now has better customization abilities, support for hot-plugging of USB storage devices, support for NVMe devices now in addition to SATA, interactive WiFi configuration, UEFI boot support, and many other improvements. ReactOS, the “open-source Windows” operating system re-implementation, is now able to finally self-host itself in fully compile ReactOS from ReactOS. ReactOS developer Pierre Schweitzer announced today that ReactOS is fully self-hosting. For the last year or so the Firefox development team has been making life ever harder for users. First they broke all the old extensions that were based on XUL and XBL, so a lot of customizations no longer worked. Then they made PulseAudio mandatory on Linux bug (1345661), so on systems like mine that don’t run Pulse, there’s no way to get sound in a web page. Forget YouTube or XenoCanto unless you keep another browser around for that purpose. For those reasons I’d been avoiding the Firefox upgrade, sticking to Debian’s firefox-esr (“Extended Support Release”). But when Debian updated firefox-esr to Firefox 56 ESR late last year, performance became unusable. Like half a minute between when you hit Page Down and when the page actually scrolls. It was time to switch browsers. Trans Europa Express was covered on ghacks.net. This is an experimental Firefox extension that tries to get web sites to give you European-level privacy rights, even if the site classifies you as non-European. My team estimates the time to complete an issue using “T-shirt sizing”: we assign size labels “S” (<= 1 day), “M” (2-3 days), and “L” (4-5 days). One quick, albeit rough, way to estimate the amount of time it’d take to complete a sprint is to sum together the number of days these size labels represent (we use the upper bounds to be safe) to find out the number of “engineering days” it’ll take to complete the sprint. To find out if you’ll complete the sprint on time, this number can be subtracted by the number of engineering days until the deadline: the number of days until the deadline multiplied by the number of engineers you have. LibreOffice Draw is a vector graphics and flowcharts design tool that’s part of the free and open source LibreOffice software suite. Draw uses smart connectors that make it diagramming simple. Users can define where these connectors adhere to and automatically calculate and display the linear dimensions of their designs to build a variety of different charts and diagrams regardless of skill level. This is not the first time that Microsoft attempts to buy GitHub. Back in 2016 when GitHub was raising the second round of fundings, Microsoft saw an opportunity for itself. GitHub denied the ‘rumors’ and Microsoft declined to comment on it. GitHub is a vast code repository that has become popular with developers and companies hosting their projects, documentation, and code. Apple, Amazon, Google, and many other big tech companies use GitHub. Microsoft is the top contributor to the site, and has more than 1,000 employees actively pushing code to repositories on GitHub. Microsoft even hosts its own original Windows File Manager source code on GitHub. The service was last valued at $2 billion back in 2015, but it’s not clear exactly how much Microsoft has paid to acquire GitHub. Microsoft only has to sneeze in the direction of a company or service favoured by open source enthusiasts for placards bearing “embrace, extend, extinguish” to be thrust passionately in the air. The first RC build of the 11.2-RELEASE release cycle is now available. Ahead of its expected release by month’s end, FreeBSD 11.2 is now in the release candidate phase of development. In the changes over the past week from beta 3 to RC1 there are more bug fixes and minor enhancements. Some of the enhancements include now supporting Wake-On-LAN for Intel Icelake and Cannonlake hardware, flushing of caches before carrying out an Intel CPU microcode update, using MBR rather than GPT for AMD64 memstick installers, restoring the disc1.iso image to be under 700MB again, and then the usual variety of bug fixing. Just yesterday, we shared that The GNOME Project moved to GitLab. This was a major score for GitLab, but also, an important move for GNOME as well — it should greatly improve collaboration between its contributors. GNOME is not alone in its move to that Git-repository manager, however, as GIMP (plus the babl and GEGL libraries) also made the transition. Actually, believe it or not, GNOME is hosting GIMP there. If you aren’t familiar with GIMP (GNU Image Manipulation Program), please know that it is an open source image/graphics editor/manipulator. It is very similar to Adobe Photoshop, although GIMP is totally free. In fact, the open source Photoshop alternative is a cross-platform affair, available not just on Linux, but macOS, and Windows too. It is an extremely important program for the open source community — right up there with LibreOffice. Along with the GEGL and babl libraries, GIMP has moved to a new collaborative programming infrastructure based on Gitlab and hosted by GNOME. The 2018 trend of migrating open-source project infrastructure to GitLab continues. Following the GNOME project as well as FreeDesktop.org and other notable open-source projects migrating to GitLab for their project infrastructure with code hosting, bug management, etc, The GIMP has completed its migration too over to the popular alternative to GitHub. Despite the general public’s hijacking of the word “hacker,” we don’t advocate doing disruptive things. However, studying code exploits can often be useful both as an academic exercise and to understand what kind of things your systems might experience in the wild. [Code Explainer] takes apart a compiler bomb in a recent blog post. If you haven’t heard of a compiler bomb, perhaps you’ve heard of a zip bomb. This is a small zip file that “explodes” into a very large file. A compiler bomb is a small piece of C code that will blow up a compiler — in this case, specifically, gcc. We are looking for a programme manager for our policy work. The person will work 35 hours per week with our team in the FSFE’s Berlin office. Tesla has finally decided to release some of the Linux open-source code used by the Model S and Model X. Under open-source licenses, the electric automaker is obliged to release its software to the public but up until now, hasn’t done so. ZDNet reports that the code has been released for the Model S/X 2018.12 software release and includes the system image for Tesla Autopilot, the kernal sources of its underlying software, and Tesla’s code for its infotainment system. In a statement, Tesla said it intends on releasing more of its open-source code in the near future. “Work is underway on preparing sources in other areas as well, together with a more coordinated information page. “We wanted to let you know about this material as it is available now while work continues on the other parts,” Tesla revealed. This week was different, though, because it showed just how far the company can go with those updates. With a swift change in the software, the company showed it can reach as deep as the systems that control the brakes. It creates the feeling that you could get out of your car one night, and by the time you get back in the next morning, the car could do some things — maybe everything — in a totally different way. Certificate and acquired skills database Open Source University will on Monday (June 4) launch its ICO (initial coin offering), during which it hopes to raise as much as 34,000 Ether (Ethereum’s native currency), or roughly £15.1 million, at time of writing. The World’s Academic & Career Development Ledger. Empowering 7 billion learners to connect to world’s top academic education and professional development opportunities on the Ethereum blockchain. We apply principles of open source to re-engineer the current-state educational model by building a system to enable better business and education sectors collaboration. We are pleased to announce the release of Ruby 2.6.0-preview2. Ruby 2.6.0-preview2 is the first preview toward Ruby 2.6.0. This preview2 is released earlier than usual because it includes an important new feature, JIT. The first preview release of Ruby 2.6 is now available and its big change compared to its earlier releases is a just-in-time (JIT) compiler. The Ruby 2.6 JIT compiler is designed to improve the performance of program execution — its approach used is converting to C code, dumping to the disk, and uses a C compiler (GCC or Clang) to generate the native code. Selenium’s WebDriver is now a W3C Recommendation! We are really excited to announce that Selenium’s WebDriver has become a World Wide Web Consortium *recommendation* today, May 31st. Selenium is a free software project that has been a Conservancy member since 2011. It’s a suite of tools that enables browser automation across most modern browsers and operating systems. Selenium is also the core technology in many other types of browser automation tools, APIs and frameworks. Selenium’s WebDriver is particularly innovative because it binds tightly to a browser implementation, enabling web developers to run tests as if they were the actual user on many different environments in parallel. Samuel F. Dabney, an electrical engineer who laid the groundwork for the modern video game industry as a co-founder of Atari and helped create the hit console game Pong, died on May 26 at his home in Clearlake, Calif. He was 81. Breathing Mumbai’s air has the same effect on your body as smoking four cigarettes a day. In Delhi, it’s 7.7 cigarettes. Other big Indian cities aren’t far behind, with the effect ranging from two to eight cigarettes a day. Four more people have died because of the E. coli infection spread by romaine lettuce and 25 more illnesses have been reported, the Centers for Disease Control and Prevention reported. The outbreak is over and romaine lettuce is no longer on the warning list, but reports of cases in three more states have emerged, the agency said Friday. A total of five people have died and 197 got sick in the outbreak this spring, which originated in Yuma, Ariz. It is considered to be the largest E. coli outbreak in the U.S. in more than a decade, the CDC said. The Department of Homeland Security and the FBI said that North Korean hackers have been using both Joanap, a remote access tool (RAT), and Brambul, a Server Message Blockworm, since at least 2009 to target companies working in the media, aerospace, financial, and critical infrastructure sectors. The malware gives North Korea’s hackers — which the agencies refer to by the code-name ‘Hidden Cobra’ — the ability to steal data, run further malware and initialise proxy communications on a compromised Windows device. Other functions include file management, process management, creation and deletion of directories and node management. The United States on Wednesday renamed its strategically important Pacific Command (PACOM) the U.S. Indo-Pacific Command, in a move widely seen as a public expression of America’s keenness to count India as key partner in its strategic planning. The Donald Trump administration has been using the term Indo-Pacific instead of Asia-Pacific in official documents already. Molins’ worry that prisoners could become more radicalized [sic] in prison is a legitimate one, according to reports in the French press which say that more than 1,200 people who have been imprisoned for non-terrorism crimes have become radicalized while behind bars. Molins says prisons serve as “incubators” by allowing interactions to take place between radicalized [sic] and non-radicalized prisoners. A man accused of encouraging would-be lone wolf [sic] attackers to target Prince George at school also suggested they kill fans at UK football stadiums, a court has heard. The mines are a deadly remnant of the civil war, one of the longest in Africa, which ended in 2002. The Pentagon has told Congress that the US military killed almost 500 civilians and injured a further 169 in 2017. The civilians were killed in operations around the world, from Somalia to Yemen to Syria. “[The Department of Defense] assesses that there are credible reports of approximately 499 civilians killed and approximately 169 civilians injured during 2017,” reads the Pentagon’s report to Congress, as per CNN. Julian Assange has been detained in the Ecuadorean embassy for the best part of six years now. He is more isolated than ever with the Ecuadorean government cutting his access to the Internet in April. And the Americans are baying for his blood, some might say literally. Attorney-General Jeff Sessions and Secretary of State Mike Pompeo have made no secret of their desire to shut down WikiLeaks which the latter calls a “hostile non-state intelligence service”, and to see Assange arrested. This week, the senior Democrat congressman on the House Intelligence Committee, Adam Schiff, rebuffed overtures to meet Assange with the statement that he would only do so when Assange was in US custody. There is an opportunity for Australia to help resolve matters, particularly given that the reason for the reticence on Canberra’s part to involve itself in the Assange case has now gone. While Assange has been granted Ecuadorean citizenship he remains an Australian citizen and has familial ties to this country. Assange has strong family ties to Australia: both his parents live here and are aging, and this is the country he grew up in and lived in for the first two and a bit decades of his life. Up until 2010 this was home. The U.S. Army Court of Criminal Appeals has upheld the conviction and sentencing of Chelsea Manning, the former soldier responsible for sourcing hundred of thousands of classified military and diplomatic documents published online by WikiLeaks. In a 26-page opinion issued Thursday, a three-judge appellate panel affirmed the results of the 2013 court-martial that ended with the Army intelligence analyst being ordered to spend 35 years in military prison. “We are confident that based on the entire record and appellant’s course of conduct, the military judge would have imposed a sentence of at least that which was adjudged,” Senior Judge Col. Lorianne Campanella wrote on behalf of the panel. Relatives of Reality Winner, an Air Force veteran charged with leaking classified National Security Agency material, plan to hold a candlelight vigil Sunday exactly one year after she was taken into custody. Supporters of Ms. Winner, 26, are expected to commemorate the anniversary of her June 3 arrest outside the Lincolnton County Jail in Lincolnton, Georgia, north of Augusta, where she remains in detention awaiting trial. the world to forget her,” she said in a statement. By this weekend, Reality Winner, the former NSA contractor accused of releasing national security information to the media, will have been in jail for more than a full year without being convicted of a crime. Her trial, originally scheduled for October 2017, has been pushed back multiple times and is now on the docket for October 2018. It’s anyone’s guess whether the case will drag on even longer. Winner, unfortunately, is caught between two camps — a whistleblower without a constituency — even as her alleged transgression proved a pivotal moment in the hot-burning media story of the investigation into potential attempts by Russia to interfere in the 2016 election. These individuals will never be prosecuted by the Mnangagwa government because he is involved with entirely all of them. Either they were in the deal together or they know too much of his own dirty deals or assassination assignments. These individuals have larger than life expenditure and live beyond any business means in Zimbabwe. Their corruption cases are widely known yet they walk freely abusing state resources daily. The neon red text, which read “Resist the attempted silencing of Julian Assange,” was projected onto a black backdrop before his concert on Saturday night. Waters, who is known for making radical political statements on stage, is an admirer of Assange and has previously featured images of the whistleblower in his shows. Pink Floyd co-founder Roger Waters used his concert in Berlin Saturday night as an opportunity to show support for WikiLeaks founder Julian Assange. The neon red text, which read “Resist the attempted silencing of Julian Assange,” was projected onto a black backdrop before the concert. Waters, who is an admirer of Assange, has previously also featured images of the whistleblower in his shows. On 19 June 2018, it will be six years since Julian Assange was forced to take refuge in the Ecuadorean embassy in London. He had been warned that the US planned an extradition warrant for his arrest. His ‘crime’ was that of a scrupulous editor – WikiLeaks had revealed the war crimes of the US. Today, Julian has never been more isolated, and his health is failing.On Sunday 17 June, the SUP will stage a rally for Julian in the heart of Sydney, Australia, his homeland. This is backed by John Pilger, Roger Waters, Julian Burnside QC and Terry Hicks, father of former Guantanamo prisoner, David Hicks. John Pilger will address the rally from the steps of Sydney Town Hall, which starts at 1pm.On Tuesday, June 19, there will be a rally and vigil outside the Ecuadorean embassy in London, beginning at 6pm. Other vigils will be held outside British embassies around the world on the same day. In Dublin, Nobel Peace Prize winner Mariead Maguire and members of the Irish parliament, Clare Daly & Mick Wallace, will speak in support of Julian outside the British embassy.The above image shows a salute to Julian Assange by Rogers Waters at a recent concert. The US Army Court of Criminal Appeals has upheld Chelsea Manning’s convictions and sentencing, in a 26-page ruling released this week. The ruling will not have come as a surprise to Chelsea’s lawyers, Vincent Ward and Nancy Hollander, have indicated that the appeal will now go to the next stage, the Court of Appeals for the Armed Forces. Chelsea’s legal team, supported with amicus briefs from the EFF, ACLU, and Amnesty International, contested Chelsea’s conviction under the Computer Fraud and Abuse Act and the Espionage Act, as well as the amount of time she was credited for abusive prison conditions before trial. The appeals court struck down each argument, fully affirming the military judge’s decision – with the minor exception being that the court was not convinced that the Global Address List, containing 74,000 military addresses, exceeds the value of $1,000 necessary to qualify as felony theft. Manning’s defense argued that Chelsea did not “exceed authorized access”, which constitutes a CFAA violation, by viewing the documents she ultimately sent to WikiLeaks, and that using a program (Wget) to download them quickly did not change the nature of her access. The EFF’s supporting brief similarly argued that this is a question of “use”, not “access.” The EFF also argued that the CFAA was written to criminalize “hacking,” not the “use” issues at play here, and that the CFAA has been rendered unconstitutionally broad. The court disagreed on all counts. On May 23, Massachusetts’s awarded its first offshore-wind contract to Vineyard Wind for a 800 MW, 100-turbine farm to be built further offshore then previous projects were planned for, in order to avoid local opposition. It will fulfill the first half of a legal commitment, made in a 2016 energy law, by the state to purchase 1,600 megawatts of offshore wind. Trump breaks things. He’s not a deal-maker. He’s a deal-breaker. Producers of electricity have realized coal is too inefficient and dirty to be continued but Trump wants to keep his ill-considered promise to keep coal going and is considering ordering industries to keep buying coal. Three US states announced major investments in charging infrastructure for electric cars on Thursday. In total, California, New York, and New Jersey will put $1.3 billion on the table in the coming years to help chip away at one of the biggest barriers standing in the way of widespread EV adoption. All three investments are some of the biggest these states have committed to regarding building EV charging infrastructure. But while they might not directly affect the other 47 states, there’s reason to believe this news could help influence the spread of EVs around the country, according to Karl Brauer, executive publisher of Autotrader and Kelley Blue Book. California is at the forefront of US states when it comes to reducing carbon emissions. Nearly 40% of those emissions come from the state’s transportation sector. Not only has California always been ground zero for car culture, it also is home to several of the largest ports in America whose operations depend on heavy duty trucks powered by diesel engines. Major retailers had earlier confirmed that card purchases were failing. Queues built up at petrol stations and shopping was left at supermarket tills as customers were unable to pay. Card networks are generally not great because they end up being moderators for content that passes through their network. Kaitlin Cawley finished grad school with $95,000 in student loans, including a $24,000 variable-rate loan that started at 9.4% and now stands at 11%, a loan that the US government lender Sallie Mae brokered for her when she was 20. Sallie Mae’s portal makes it almost impossible to find out how much you’ve paid into your loans; after a lengthy runaround, Cawley found that she had paid back $18,000 of her $24,000 loan, but that she still owed the full amount, thanks to sky-high interest and stiff penalties the government assessed against her because she opted to save tens of thousands of dollars by going to grad school outside of the USA. Cawley comes from a working-class background and her family was not able to substantially offset the expense of her university. She attended anyway, convinced that postsecondary education was the path to social mobility. Despite an advanced degree, Cawley lives in relative penury, largely thanks to her student debt. Four candidates backed by Democratic Socialists of America won Pennsylvania primaries Tuesday, and come November they could all be legislators. Hancock is believed to have shot and killed his passenger with his Ruger SR40 in the early hours of Friday morning while they were driving down Interstate 25, a primary north-south artery in the city. This is just the latest troublesome incident for the ride-hailing company in Denver and the state of Colorado. In April, Denver law professor Nancy Leong fired off a series of tweets describing how her Uber driver told her he was going to take her to a hotel instead of the Denver International Airport. At a stop light, she said she screamed and pounded on the vehicle windows until nearby construction workers noticed and the driver then unlocked the doors and Leong got out. The information on these cards is often taken from Wikipedia entries, which is what seems to have happened here. Six days ago, someone edited the Wikipedia page for “California Republican Party” to include “Nazism,” something that wasn’t changed until Wednesday, Wikipedia’s edit logs show. Google’s artificial intelligence pulled that data, displayed it under search, and now Republicans have more ammo in their ongoing Google-is-biased crusade. Mark Bee, Conservative leader of Waveney District Council, said: “The allegation was made to Brandon Lewis [MP for Great Yarmouth] regarding Stephen Ardley about comments alleged to have been made on social media two years ago. After former CIA director John Brennan penned a scathing op-ed in The Washington Post attacking President Trump, the commander-in-chief fired back on Twitter Saturday, citing one of his favorite cable news shows, Fox & Friends. Former CIA Director John Brennan sharply criticized President Trump in a Washington Post op-ed published on Friday. The president “has shown highly abnormal behavior by lying routinely to the American people without compunction, intentionally fueling divisions in our country and actively working to degrade the imperfect but critical institutions that serve us,” Brennan writes. To hear the former CIA director turned NBC pundit John Brennan tell it, Donald Trump has destroyed the prestige of American presidency. Intent on playing his part in the #Resistance, Brennan glosses over some genuine horrors. The career spy, who led the CIA during President Barack Obama’s second term (2013-2017) penned an angry op-ed in Thursday’s Washington Post, blasting President Trump’s character and temperament and lavishing praise on his predecessors. Biden’s reservations for the raid are laid out in the book, the excerpt shows. “My sense is that [Clinton] was not sold on the idea either,” David Axelrod, a former senior adviser to Obama, said in the book excerpt. World Values Survey results indicate that in Europe and the United States, people who describe themselves as “centrist” on the average have less attachment to democracy (e.g. free and fair elections) that those on the left, and even those on the far right. This is not as surprising as it may seem at first, since “centrists” are by definition attached to the status quo. In European countries, the authoritarian neoliberal “center” is institutionalized in the European Union, which imposes economic policy over the heads of the parliaments of the member countries, dictating measures which conform to the choices of Germany and northern Europe, but are increasingly disastrous for the Southern EU members. Italian disillusion is particularly significant. Italy was an exceptionally enthusiastic founding member of the unification begun with the 1957 Treaty of Rome. And yet, Italy’s own history illustrates what can go wrong with such unification, since the 19th century political creation of a unified Italy centered in Turin led to the enrichment of the industrial north at the expense of southern Italy, where the splendor of Naples declined into chronic poverty, crime and corruption. Now Italy itself is “the south” in the periphery of a European Union centered around Germany. Twenty years ago, on June 1, 1998, the DVD format launched in Ireland, sounding the death knell for the video cassette. He was not exaggerating. The DVD provided a better picture quality, and wasn’t prone to spaghetti tape snarl-ups, but it was merely an evolution. The VCR which it extinguished had been a revolution, and its impact on Ireland had been more revolutionary than just about anywhere else. The video cassette was revolutionary in that it transformed viewing habits unchanged since the birth of TV. Prior to its arrival, all viewing was strictly in real time. If you wanted to watch the football, or catch that soap cliffhanger, you had to be perched in front of your TV as it happened. Miss it, and it was gone forever from a world where broadcasters and viewers alike believed that screening repeats was short-changing the public. Offering the ability to record in your absence and watch at your leisure, the VCR was a magical game-changer. In line with the new government’s commitment to freedom of speech and expression, a group of filmmakers and human right activists are urging for the Government to reform the Film Censorship Act 2002. The Freedom Film Network (FFN) has called on Home Minister Tan Sri Muhyiddin Yassin and Minister of Communications and Multimedia Gobind Singh Deo to enable an environment where independent film makers can flourish. “FFN would also like to see the de-politicisation of film regulating bodies such as Lembaga Penapisan Filem and FINAS, who should be made independent and transparent in all their dealings,” FFN said in a statement on Sunday (June 3). Military rule, religious extremism, and war have long made Pakistan one of the world’s toughest beats for journalists. But Pakistani reporters say free media is now being shackled like never before, as veteran reporters have been leaving after experiencing threats, the nation’s most popular TV station was forced off the air, and nationwide distribution of Pakistan’s oldest newspaper has been halted. The developments are threatening the independence of the already depleted ranks of free-press torchbearers, who have come under pressure from the all-powerful army, hard-line religious groups, and militant groups. Global marketplace Everpress and Amnesty International have linked up to release a line of artist-led T-shirts designed to raise awareness about censorship. With 50 young artists and designers tapped for the 50/50 Project, T-shirt contributors include the likes of Octavian, Liam Hodges, Dexter Navy and more. For more than 15 years, Fox News has become the posterchild when it comes to hush-money payouts to former employees and other litigants. Almost all of the “button-your-lip” settlements involve sexual misconduct and harassment by men in power positions at the cable network. Turn the clock back to the late evening of July 25, 1967 in Phoenix, where racial tension had been festering for years amid allegations of police brutality. The city schools were segregated, poverty and joblessness were endemic. I was working the late-night shift at the AP Bureau, when violence erupted in the heart of the city’s black neighborhood, the start of a three-day rampage. Our six-man bureau would be put to an unexpected and unwanted test as a result of a decision by media mogul, Eugene C. Pulliam. House Intelligence Committee Chairman Devin Nunes condemned Twitter on Sunday for continuing to apply a layer of censorship on the Drudge Report. Spotify has formally halted its hate content and hateful conduct policy, just weeks after the streaming giant ceased promotion of R. Kelly and XXXTentacion‘s music following sexual misconduct and domestic abuse allegations made against both artists. Although R. Kelly’s music continued to perform well in spite of its removal from all Spotify branded algorithmic and curated playlists, the policy that deemed both R. Kelly and XXXtentacion to be in conduct related violation proved to be controversial among many who accused Spotify of practicing censorship through the policy. Kendrick Lamar notably threatened to pull his music from the platform if Spotify continued to enforce the policy. Former National Security Agency contractor Edward Snowden blew the lid off U.S. government surveillance methods five years ago, but intelligence chiefs complain that revelations from the trove of classified documents he disclosed are still trickling out. That includes recent reporting on a mass surveillance program run by close U.S. ally Japan, and on how the NSA targeted bitcoin users to gather intelligence to counterterrorism, narcotics and money laundering — both stories published by The Intercept, an investigative publication with access to Snowden documents. A few months after Edward Snowden emerged from the shadows of America’s espionage world to shine a light on the murky business of mass surveillance, the NSA contractor said he never set out to upend the system. “I wanted to give society a chance to determine if it should change itself,” the former intelligence agent said in Russia, where he has been living since leaking thousands of classified documents in the summer of 2013. Five years on, it seems society no longer fears Big Brother so much as Big Tech. Again, IMSI catchers have been known to be active in Washington for some time. In 2014, researchers with the security company ESD America detected IMSI catchers scattered across Washington, DC in the vicinity of the White House, the Russian Embassy, and Capitol Hill. Some of these may have been operated as part of counterintelligence or law enforcement activity, but some portion of the devices detected in 15 areas of interest by ESD America may have been operated by foreign intelligence organizations. The technology required to create IMSI catcher devices has only become more accessible over the past four years. “I’ve implored the political administration to arrest the culprits but the police have not taken any action as they say it is de-facto tribal area,” he said. Child marriages are rampant in Khyber Pakhtunkhwa mainly due to poverty, revealed a recent research. Emily Weinman, a smidge under drinking age at 20 years old, went to the beach in Southern New Jersey to enjoy Memorial Day with her daughter, her daughter’s father, and a friend. A police officer suspected her of underage drinking, and he didn’t take kindly to her screaming when he tried to arrest her, so he punched her a couple of times. Sarita Thapa’s day is gruelling – cooking, chores, childcare and up to 12 hours in the field. But because she is ‘accompanying’ her husband, she earns only half as much as he does. The Conservatives also want to weed out informal “moral police” who monitor how women and girls in Swedish suburbs appear before the public eye and see to it that they are “correctly” dressed and behave themselves accordingly. Individuals suspected of involvement with “moral police” will be refused access to certain premises. According to Tobé, such refusals will be issued immediately, without having to wait for a court order, and will first and foremost affect people patrolling the streets. Britain’s spies stand accused of continuing to share intelligence obtained under torture, in breach of official guidance. The damning claim, outlined in a letter to the foreign secretary, Boris Johnson, is made by his Labour shadow, Emily Thornberry, and the shadow attorney-general, Shami Chakrabarti. They point to hitherto unpublicised figures buried in the latest annual report from the Intelligence Services Commissioner (ISC), who has a statutory duty to review the way MI5, MI6 and GCHQ share intelligence. The use of intelligence obtained abroad is governed by an official document, the Consolidated Guidance on the Detention and Interviewing of Detainees Overseas. According to the latest ISC report, released in the run-up to last Christmas, in 2016 the three agencies and the Ministry of Defence felt a need to consider the guidance in 921 cases – more than double the number the previous year. Police have said they have no idea how much a five-year probe into the use of Scottish airports by CIA torture flights has cost the taxpayer. An investigation into so-called rendition stopovers was ordered in 2013 by then lord advocate Frank Mulholland. Police Scotland and the Crown Office said the investigation is “ongoing”. But police said they did “not hold information” on the cost – stating “officers involved in this inquiry are not required to collate timesheets detailing how their time is spent between this inquiry and other policing business”. Britain’s spies have been accused of continuing to share intelligence obtained under torture by foreign states. Labour’s Shadow Foreign Secretary, Emily Thornberry, and Shadow Attorney-General, Shami Chakrabarti made the damning claim in a letter to Boris Johnson – citing unpublicised figures from the latest annual report from the Intelligence Services Commissioner (ISC). This week there was IP activity in both China and U.S. covering a wide range of trademarks (filings and RTMs) and design patents covering the Siri app icon for macOS High Sierra; AirPlay 2; the word ‘Promotion’; Face ID covering ‘Monsters’ and more; and Apple’s ‘Heart Study’ icons in color and black & White. The USPTO only began publishing applications in 2001 and so growth was expected. Published patent applications are especially useful because their timing of publication (18 months after filing) corresponds well with the prosecution timeline (First action at approximately 15 months). For patent applications that never issue as patents, the publication does more than simply shift-back timing — those patent documents would have never entered the public domain. I have not yet gone back to research what percentage of cited published applications fall into this second category of published-but-never-patented. As a staunch defender of privacy and serial critic of copyright trolling activities, Bahnhof has carved out a niche as one of the most customer-friendly ISPs in Sweden. The company certainly isn’t scared of speaking its mind and in a new broadside, it targets several of the country’s judges, questioning their impartiality for supporting pro-copyright groups while presiding over important copyright cases. As it turns out someone was stealing ‘for real.’ Not by sharing copies of books, but by messing with royalties, as the New York post explains in detail. The alleged mastermind is Darin Webb, an accountant who’s accused of embezzling millions of dollars from the prestigious literary agency Donadio & Olson. 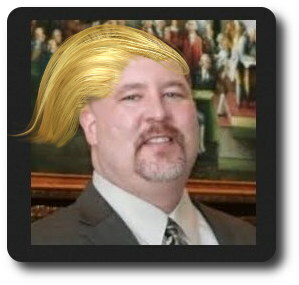 Webb was indicted by the US Government and confessed his wrongdoings in a video interview, according to the complaint. THE JUDGE-BASHING Watchtroll has managed to outdo itself yet again. The only thing which surprises us is that some companies (like IBM) are willing to associate themselves with it. Iancu (USPTO Director) even gave them an interview recently, after they had repeatedly bashed his predecessor. “Does IP Kat really want to declare a war on judges? The very same thing which destroys the EPO?”How low can one sink? IP Kat, which used to cover EPO scandals, is nowadays writing stuff which cites Watchtroll and attacks patent judges. It did this again a few hours ago, not too long after the UPC and software patents nonsense of last week. 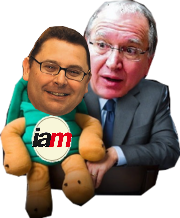 Does IP Kat really want to declare a war on judges? The very same thing which destroys the EPO? Remember that the EPO attacked or ignored judges at many levels (ILO, The Hague, BoA and more). 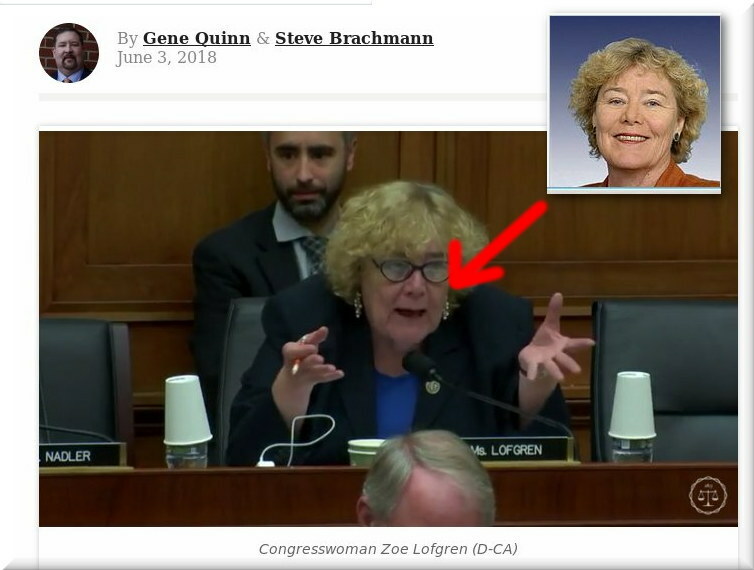 At a recent House Judiciary Committee Oversight Hearing, Congresswoman Zoe Lofgren (D-CA) jumped into the patent troll debate with both feet, casting herself as a staunch defender of efficient infringement as she wondered what in the world is going on at the United States Patent and Trademark Office. For additional coverage see here and here. According to OpenSecrets.org, the campaign committee of Zoe Lofgren has received $770,600 in contributions during the 2017-18 election cycle. More than $130,000 worth of that total comes from the electronics manufacturing and equipment sector, the single largest industry sector contributing money to Lofgren’s 2018 re-election campaign. The top 20 contributors to Lofgren include a host of names that are deeply entrenched in the efficient infringement side of the battle for the soul of the U.S. patent system. This includes Cisco, a member of the High Tech Inventors Alliance and the 2nd-largest contributor to Lofgren’s campaign ($25,250). Other tech giants contributing to Lofgren’s coffers include Alphabet (6th largest, $18,800), Microsoft (7th, $14,300), Apple (9th, $10,900), Facebook and Netflix (both 14th, $10,400). Given that these funds, which are crucial to Lofgren, represent a small fraction of what any of these tech giants would have to pay if patent owners could actually enforce their patent rights in the face of infringement, it makes prefect sense for those companies to contribute within the limits (or lack thereof) of the law. Even if she ‘works’ for technology firms rather than a bunch of litigators, does that make it a problem? At least she isn’t taking money from firms like Monsanto, whose entire business model depends on patenting life/nature — a concept as ludicrous as it sounds (rejected in other countries outright). Summary: The blockchain hype which facilitates the patenting of many algorithms is being noticed; but what might the courts decide on such questionable patents, which even PTAB is likely to invalidate pretty quickly? THE EPO favours particular software patenting buzzwords which the USPTO adopted as well. “Blockchain” is one of those, albeit blockchains are mostly hype, much more so than a buzzword per se (there’s a clear technical concept behind blockchains but almost everything with a database can be spun as “blockchain” — same for algorithms as “AI”). The lawyers’ ‘community’ (or ‘industry’) has long obsessed over “blockchain/s” for two reasons; first, it saw it as an opportunity to ride a wave to patent software and second, in our humble assessment, it has been led to believe that distributed databases — a concept few of these lawyers even understand — would somehow (magically) revolutionise their field/profession. The latter isn’t a justifiable belief and the former is a temporal reality; wait until it blows in their face — or rather — in their clients’ face. Imagine investing millions if not billions in some worthless patents. “…wait until it blows in their face — or rather — in their clients’ face. Imagine investing millions if not billions in some worthless patents.”As should be widely known by now, IBM is still pursuing worthless, useless software patents. IBM loses its mind over it and now spends a fortune lobbying for software patents (IBM has become a lot worse than Microsoft in that regard). IBM wants us to think that “blockchain/s” patents are worth pursuing while its front group OIN does the same. A few days ago at Bitcoin Exchange Guide we found coverage titled “IBM Continues Distributed Ledger Future Securing 2 Crypto Patents” (don’t worry, these are worthless software patents). Blockchain integrity and security is something that is always constantly talked about and hotly discussed. Recently, the technological giant IBM has acquired two crucial and influential patents that will change the marketplace of cryptocurrency security. This ultimately allows for a more citable and understandable definition of a checkpoint. Moving forward, many companies will look to this as a key building block for companies wishing to utilize and create blockchain technology. When IBM goes to make any product in the future they will likely rely on this patent because it is at the core of just about all blockchain technology. It’s pretty obvious that these are software patents. Who is IBM kidding? Hasn’t it been ‘lectured’ by PTAB enough already? So many of IBM’s patents — not just the “blockchain/s” — are likely worthless. They’re just waiting to be voided (if PTAB gets petitioned to do so). In mid-2016 the Federal Circuit issued two decisions, Enfish v. Microsoft (“Enfish”) and Rapid Litigations v. Cellzdirect (“Cellzdirect”), in which it provided additional information and clarification on the inquiry for identifying an abstract idea (Enfish) and a law of nature (Cellzdirect). In these decisions, the court found claims patent eligible based on the determination that they were not directed to a judicial exception in step one of the Mayo/Alice two-step subject matter eligibility test. Analysis under step two was therefore not necessary. The court observed that the formulation by the U.S. Supreme Court of a two-stage inquiry – involving first determining whether the claims at issue are “directed to” a patent ineligible concept – implied that the “directed to” inquiry was a substantive inquiry, and not limited to simply asking if the claims involved a patent-ineligible concept. Enfish at 10. As the Federal Circuit continues to refine the standard for subject matter eligibility, it is of interest to see how these decisions are influencing the outcome of patent eligibility disputes. Vanda Pharmaceuticals, Inc. v. West-Ward Pharmaceuticals (“Vanda”), decided April 13th, 2018, provides an interesting example in this regard. Judge Prost next compared the claims to the claims in Mayo to determine how much weight should be given to the recitation of specific dosages of iloperidone. Recall that in Mayo, the claims were directed to a method of optimizing therapeutic efficacy for treatment of an immune-mediated gastrointestinal disorder. Id. at 2-3. The method required (a) administering a drug providing 6-thioguanine to a subject having the disorder; and (b) determining the level of 6-thioguanine in the subject. The claim further recited that the level of 6-thioguanine less than about 230 pmol per 8×108 red blood cells indicated a need to increase the amount of the drug subsequently administered to the subject and the level of 6-thioguanine greater than about 400 pmol per 8×108 red blood cells indicated a need to decrease the amount of the drug subsequently administered to the subject. TECHRIGHTS is very happy to see the US patent system improving; we’re exceptionally pleased about Michelle Lee’s progress and happy about the way that the America Invents Act (AIA) evolved under her tenure. Beyond things like business method review (CBM), which we shall cover separately, there are also inter partes reviews (IPRs). They’re like appeals filed even after a patent was granted. The Patent Trial and Appeal Board (PTAB) needs public and popular support. It processes IPRs and thus helps guard the USPTO from bad patents and patent extremists. PTAB is under attack and it is the subject of smear campaigns, too. All the time! It isn’t really fair to those who actually produce things and are wholeheartedly supportive of PTAB (for good reasons). Do we want a patent system which serves lawyers or one that serves scientists? Usually it can’t be both because in due course lawyers exploit scientists, urging them to file more patents and lawsuits (which they — the lawyers — can only ever profit from). The struggle is very visible in Europe right now — in the form of UP/UPC/UPCA. This post, adopting an eclectic form, is a roundup of the past week’s PTAB news and views. We are closely watching these things, as we have done for a number of years. We’re very familiar with that spin. In practice, PTAB does not attack but would gladly defend. It is the patents that “attack”, e.g. blackmail and extortion with bogus/low-quality patents. PTAB steps in to potentially hinder attacks which are frivolous. It’s like a disarmament mechanism, defusing lawsuits. Beyond this dramatic headline (“When the PTAB Attacks!”) there’s a rant about NPR’s “When Patents Attack!” and “When Patents Attack . . . Part Two!” (which help explain this headline). In the past few years, the public’s perception of the patent system in the United States has been at a low point. One of the causes of this lack of confidence in the system has been the increase in abusive patent litigation from entities that have been labelled as “patent trolls.” This problem has been magnified (and likely blown out of proportion) by the mainstream media that has been reporting on (and exaggerating) the evils of the current patent system. The patent system’s alleged failings appeared to reach the public consciousness with the two episodes of the NPR show “This American Life” entitled “When Patents Attack!” and “When Patents Attack . . . Part Two!” As we reported at the time, these episodes concluded by focusing on a single case and extrapolated all of its “perceived problems to be indicative of the entire patent system, leaving the uninitiated to probably question why we even have a patent system in the first place.” This was followed by even more one-sided “reporting” from the NPR “Planet Money” podcast (see “When NPR Podcasters Hit the Patent System”) and John Oliver’s HBO commentary/comedy show “Last Week Tonight.” A response from defenders of the patent system (outside of the blogosphere) has been slow in coming. But a couple of new videos released by, of all places, the Federalist Society does just that by highlighting the plight of Josh Malone and his struggles defending his invention “Bunch O Balloons” (see here and here). Mr. Malone’s company Tinnus Enterprises has been embroiled in multiple district court litigations and post-grant review proceedings before the PTAB. The latest chapter of that saga occurred on May 30, 2018, when the Federal Circuit reversed and remanded the Board’s final written decision in PGR2015-00018. There were other interesting legal and procedural issues considered by the Court that were ultimately deferred to the future. And did we mention that this was one of the first (if not the first) PGR appeals considered by the Federal Circuit. Nevertheless, this case stands as a prime example of why patent owners are frustrated with the current system, and why the attack on the patent system has perhaps gone too far. Addressing the issue of federal jurisdiction based on a lack of Art. III standing by plaintiff, the US Court of Appeals for the Federal Circuit reversed a district court’s dismissal of a claim for correction of inventorship for lack of standing, finding that there was at least a factual dispute about any implied assignment or promise to assign patent rights by the inventor. James v. J2 Cloud Services, LLC, Case No. 17-1506 (Fed. Cir., Apr. 20, 2018) (Taranto, J). The Federal Circuit noted that the district court did not conclude otherwise but found this reasoning inapplicable, focusing instead on the important qualification that “[w]hen the owner of a patent assigns away all rights to the patent, neither he nor his later assignee has a ‘concrete financial interest in the patent’ that would support standing in a correction of inventorship action.’” The Federal Circuit noted that the district court relied on two sources for its conclusion—the SDA and the “hired-to-invent doctrine”—but explained that neither supported the conclusion that James had assigned, or obligated himself to assign, his patent rights to JFAX, at least not at this stage of the action. The Court noted that the SDA was amenable to the construction that James did not assign or promise to assign patent rights that would have accrued to him as an inventor. The Court also noted that the hired-to-invent principle does not apply where the underlying agreement for engagement of services was between two legal entities where the inventor was not personally a party. We don’t want to heckle Kim, at least not too much (she probably doesn’t deserve this), but let’s get the narrative right. When someone merely asserts something (or accuses someone) and then faces questions/challenge that someone isn’t “under attack” and trying to “survive”; this whole attack started with the accuser (or plaintiff). Stop twisting it like that. We’re seeing that almost every week and it’s always law firms that do this. PTAB, moreover, never attacks anyone; the CAFC doesn’t attack either, it’s just checking what the law says and passes judgment. “PTAB, moreover, never attacks anyone; the CAFC doesn’t attack either, it’s just checking what the law says and passes judgment.”Want to see attacks? Then check out what patent trolls are doing behind the scenes several times per day, in effect blackmailing companies and causing people to lose sleep. Want to see what PTAB does to patent trolls and their attacks? Well, it stops many such attacks. It’s breaking up fights. On June 1, 2018, Unified filed a petition for inter partes review (IPR) against U.S. Patent 8,213,417 owned and asserted by Mobility Workx, LLC, an NPE. The ’417 patent is directed to providing a “preemptive and predictive solution” for allocating network resources in support of wireless devices traveling from network to network. This patent has been asserted in district court litigation against Verizon and T-Mobile. Another patent troll (whose patents are likely invalid) was mentioned on the same day: Barkan Wireless. On June 1, 2018, Unified filed a petition for inter partes review (IPR) against U.S. Patent 8,014,284 owned and asserted by Barkan Wireless IP Holdings, LP, an NPE. The ’248 patent, directed to an “add-on base station” in a cellular network, has been asserted in district court litigation against Verizon and Samsung. So what we have here, yet again, is PTAB actually preventing fights (or “attacks”). No need to reverse narratives here; it’s clear what’s going on. We’ve put some similar new examples in our daily links; litigation misconduct seems to have become rather commonplace. So who’s attacking and who’s defending really? So in this particular case PTAB actually defended a patent; did it “attack” it by merely pointing out that the patent application pertains to abstract ideas? Not really. That’s what assessment/examination/determination is all about. “Needless to say, haters gonna hate and sites like Watchtroll will attack PTAB no matter what.”We can expect the patent microcosm to keep harping about it (rather than the many cases where CAFC agrees with PTAB) because that’s just their modus operandi. PTAB’s image is something they wish to paint as “controversial”, no matter how dishonest the means. Here’s Anticipat doing the same thing again. 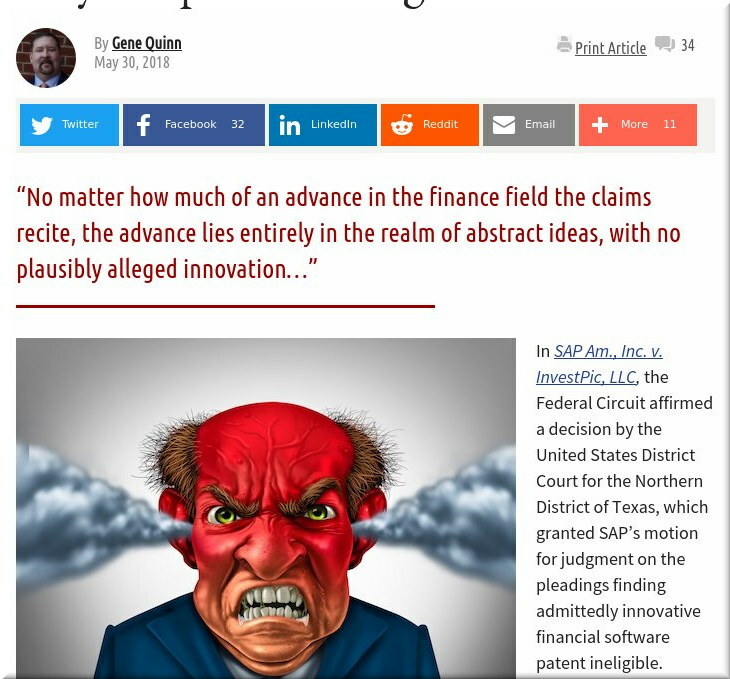 The business model of Anticipat is bashing PTAB and pestering/bothering examiners/judges when they invalidate patents or reject cases, so no wonder they’ve just come out with a rant: “Some things are not right with the USPTO’s ex parte appeal process” (their headline). In the past month, two complementary but distinct criticisms of the ex parte appeal process have emerged. They deal with the way the Board treats appeals where the Examiner embellishes/modifies the rejections in between the last rejection on the record but before forwarding to the Board. These are serious criticisms that deserve serious attention. As people learn more about current Examiner practices, expect change at some level at the PTAB. They have cherry-picked just two among hundreds. Does that support their assertion/headline? Of course not. Mere conjecture and innuendo, just like saying that PTAB is an “attacker”. This is just one among many cases (it used to be about 80% of the total being considered) where the court (re)affirmed PTAB. So where’s the “controversy”? Where’s the “attack”? Why won’t they just leave PTAB alone to do its job? IT IS bad enough that Trump has put the USPTO in the hands of the patent microcosm (Iancu, whose firm had worked for Trump prior to the nomination). Do we want the debates too to always be controlled by the patent microcosm? It’s just a gigantic, nonstop lobbying-fest. Earlier this year, the European Patent Office (EPO) released their annual statistics report for 2017 which made for very interesting reading in a number of areas. In particular, this covers the first full year passed since the EPO initiated their Early Certainty from Opposition scheme in July 2016 aiming to bring the length of opposition proceedings down to an average of 15 months from the end of the nine month opposition window. The quality indicators section of the report shows that that the average (median) duration of oppositions has now dipped below two years from 24.8 months in 2016 to 22.4 months in 2017, around a ten percent change. The average duration was 26.1 months in 2015, hence a five percent shift in 2016. Last month, the EPO Boards of Appeal issued their annual report for 2017 which shows, unlike oppositions, the average duration of opposition appeal proceedings has increased, albeit slightly, from 34 months in 2016 to 35 months in 2017. In 2015 the average length was also 34 months. Isn’t it incredible that they fail to mention EPO scandals? Even when speaking about the EPO Boards of Appeal? It’s just like IAM, the EPO’s unofficial mouthpiece. It doesn’t seem to matter how much illegality and corruption happens at the EPO, they will never even bring up the subject. Matthew L. Fedowitz, Philip L. Hirschhorn, and Christopher M. Cherry of Buchanan Ingersoll & Rooney will guide patent counsel on the use of secondary considerations at the Patent Trial and Appeal Board (PTAB), examine what works and what does not when seeking to defeat validity challenges, review Federal Circuit decisions addressing secondary considerations evidence presented in an IPR trial, and offer best practices for arguing secondary considerations at the PTAB. The Intellectual Property Owners Association (IPO) will offer a one-hour webinar entitled “A New PTAB Landscape: The Impact of SAS, Recent Federal Circuit Decisions, and the Proposed Change to the BRI Standard” on May 31, 2018 from 2:00 to 3:00 pm (ET). That was a few days ago. We can imagine how ‘objective’ it was, coming in the form of a “webinar” from IPO.